Leaping back into stores is one of the most popular Scratch GamesTM ever offered by the Idaho Lottery. Frogger will be leaping from the lily pads, across the roads, through the parking lots and into tickets dispensers beginning in April. Just like its predecessors, the Lottery version of the popular 1980’s timeless arcade game plays true to the timeless arcade version, only without the joystick, arcade music, and sound effects. Of course the trade-off is a game filled with prizes from $5 to the top prize of $50,000. The game also offers over $1 million in prizes from $25 to $50! 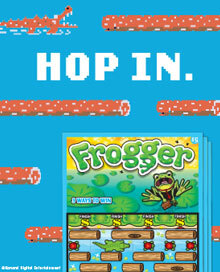 To get to the online game, scan the QR Code on the back of the Scratch Game ticket or visit www.idaholottery.com/frogger. 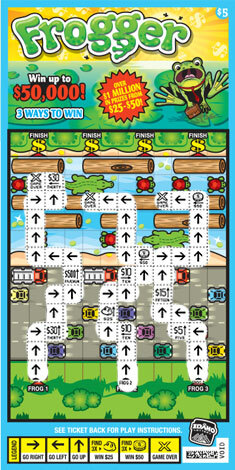 To play the actual Scratch Game Frogger, players will need to flip the ticket over to the front side of the game. Players receive three frogs on each ticket, each hoping to dart across a busy, traffic filled street, navigate a treacherous river filled with turtles and logs, and hop into the finish play area before meeting an untimely peril. Players that successfully get their frogs safely to the finish win that prize. Prizes can also be won during the frog’s journey to the finish area. If a player uncovers three identical symbols along all three paths, either three frog or three coin symbols, players win the prize for that symbol. If a player uncovers three identical prize amounts from along all three paths, players win that prize amount. All non-winning Frogger tickets may also be entered to win the grand prize, second chance draw of $1,000 cash, a Sony Playstation 4, and Frogger Game. The draw will occur when the game officially hops out of stores and ends. Frogger the Scratch Game leaps back into stores in early April with all the fun and excitement of the classic arcade game, just be sure to use a lucky scratcher instead of a joystick to try and win cash prizes. Play Frogger today!